Ther are two ways of making porchia kozhambu. One is Thanjavur style and the other one is Kerala style Poricha Kozhambu. This is Kerala Style Poricha Kozhambu. I wanted to make eggplant poricha kozhambu, but after finishing the preparations, I realized that there is no eggplant in my fridge. Then wanted to try it with raddish. Here goes the recipe. Pressure cook karamani till its done and keep it aside. In the mean time, squeeze tamarind juice and keep it aside. Take a wide bottomed pan, put the raddish pieces, tamarind water, turmeric powder, sambar powder and required amount of salt and let it boil or 7 to 10 minutes or till the raddish is 3/4th cooked. Mean time, fry the ingredients given "To Grind" to golden brown and grind it into a fine paste. Keep it aside. When the vegetable is 3/4th done, add the grounded paste to it along with required amount of water and let it boil for another 5 minutes. 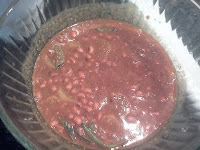 Now add the cooked karamani to it along with the powdered jaggery (optional) and let it cook for another 5 minutes. Now Poricha Kozhambu is ready to serve. It goes really well with white rice. Also with Verum arisi adai. Never tried poricha kuzhambu with radish,sounds good! Thanks for sharing the authentic recipe! This is new for me too but looks delicious!